Don't go out and buy a bag of self rising flour! Save the money! You already have the 3 ingredients to make it in your own pantry. I make mine fresh to order as I need it in my baking. 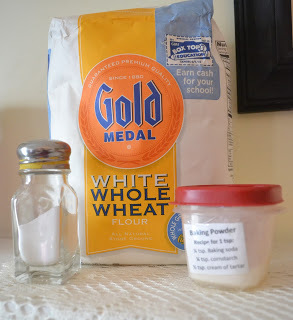 Just print this recipe off and tape it to your flour canister or to the inside of your cupboard. You'll be glad you did! Mix together. Makes 1 cup of self rising flour. You will probably find the recipe you are making already calls for baking powder and salt. Make sure to measure them out separately . First for the self rising flour and then the second time for the additional ingredients called for in the recipe.